We’re back from our honeymoon and have been looking forward to cooking at home again, especially after receiving so many cooking related gifts at our wedding reception! Tonight, from Mexican Everyday, (thanks, Tabors! ), and sitting on a new platter (thanks, Amy!) 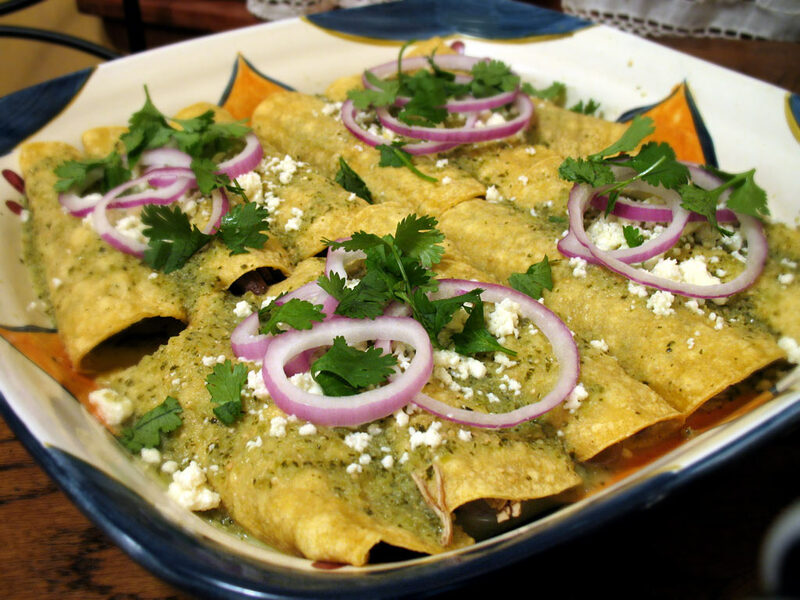 we made these delicious enchiladas filled with spinach, mushrooms, and chicken, and topped with a tart tomatillo sauce. It was a nice change from the cheese-laden enchiladas we normally encounter. It’s good to be back! Drop the garlic and serranos one piece at a time into a running blender or food processor, letting each piece get finely chopped before adding the next. Add the tomatillos and cilantro, process until smooth. Heat 1 1/2 tbsp olive oil in a medium saucepan over medium-high heat. Add the puree and cook until the mixture has reduced considerably, around 7-8 minutes. Add the chicken broth and simmer over medium heat for about 10 minutes. While the sauce is simmering, heat the remaining 1 1/2 tbsp olive oil in a large skillet over medium-high heat. Add the mushrooms and cook for a couple of minutes until they start to brown. Add about three quarters of the onions and continue cooking until the onions turn translucent. Add the spinach and chicken, stirring constantly, until the spinach is wilted. Season with a teaspoon of salt, and cover to keep warm. Lay out the tortillas on a baking sheet and spray on both sides with cooking oil, then stack in twos. Bake for 3 minutes or until soft and pliable. Remove and stack in a single pile; cover with a kitchen towel to keep warm. Stir the creme fraiche into the sauce. Taste and season with salt, if desired. Hold a tortilla by one edge and dip into the sauce and lay on a plate. Fill the center with 2 heaping tablespoons of the filling, then roll and lay seam side down on a plate. Repeat with two more tortillas, arranging them on the same plate. Douse the enchiladas with about 1/4 cup of the warm sauce, sprinkle with a quarter of the crumbled cheese and garnish with reserved onion and additional cilantro sprigs. This entry was posted on Tuesday, August 28th, 2007 at 9:20 pm	and is filed under Main Dishes, Mexican Everyday. You can follow any responses to this entry through the RSS 2.0 feed. You can leave a response, or trackback from your own site. Mark has been telling me about your blog and I just checked it. I love it. You all are something else. When are you coming to Texas to cook for us? You can even stay with us.